Last week Lucinda Williams was honored by the Americana Music Association with its Lifetime Achievement Award for songwriting. This past Wednesday night at St. Petersburg’s Jannus Live she proved why she deserved it, delivering a musical masterclass of heartbreak, remorse, and redemption for nearly two solid hours. Her aching, windswept voice resonating rich and vibrant in the open-air venue’s crowded courtyard, Williams delivered each song with distinct consideration and purpose. Early highlights included the Car Wheels on a Gravel Road gem, “Drunken Angel,” and a honky-tonk-tinged rendition of "Well Well Well," from 2008's underrated Little Honey. “Steal Your Love” and “Essence” came off gutsier, grittier than their recorded counterparts, thanks in no small measure to Williams' ace band (and opening act) Buick 6. “Side of the Road” and "Blue" – the former a plaintive lament; the latter a mournful masterpiece – were rendered with unmistakable poignancy and charm. Williams premiered two as-yet-unreleased tracks, one original and one cover, both of them solid performances. Her own “Stowaway in Your Heart” featured a funky rhythm that in a way recalled "2 Kool 2 Be 4-Gotten," its lyrics bearing the refrain, "Thank you for giving me a place to hang around.” Then came an understated take on Bob Dylan's “Trying to Get to Heaven,” which Williams recently cut for a forthcoming Amnesty International project – like the 2007 set of John Lennon covers, Instant Karma: The Amnesty International Campaign to Save Darfur – that will include various artists covering his songs. “This one goes out to those marching in the street, the 99 percent,” Williams said before an extended, rambunctious version of “Joy,” her fist held high in solidarity with the Occupy protests around the country. 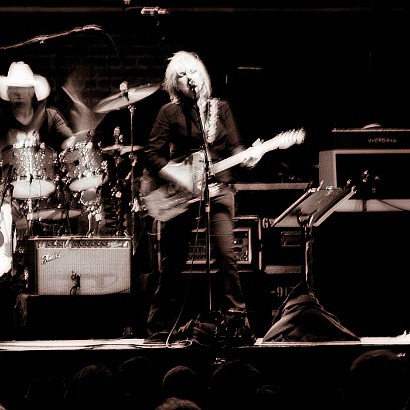 Two well-selected covers, "It's Not My Cross to Bear" (Allman Brothers) and audience favorite "For What It's Worth" (Buffalo Springfield) continued in the same defiant vein to close the show, but it was with the encore-opening title track to her most recent album, Blessed, that Williams made her most lasting, heartrending impression. "We were blessed by the forlorn, forsaken, and abused," she sang in its final verse, offering a silver lining of hope in what can often feel like a hopeless world.